She enjoyed the class so much she started taking other classes to continue learning about different processes. As my skill level increased, I started buying my own tools and equipment to take on small-scale side jobs like gates, planter boxes, and carts. “I absolutely loved building things that would pretty much last a lifetime,” Danelle says. 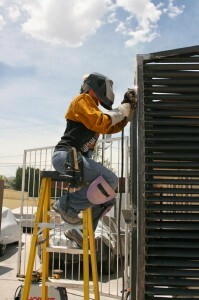 After a few more classes under her belt, Danelle was asked to teach welding classes at the College of Southern Nevada. She says it was a blast, she enjoyed every moment, and like the best teachers she says she learned just as much from the students as they learned from me. After almost two years of teaching welding classes I retired from the utility company and college and moved to Hawaii for almost a year. 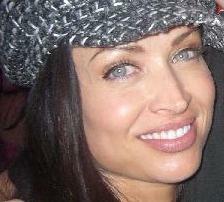 She married a military man and has now moved twice since then and landed in Northern California. 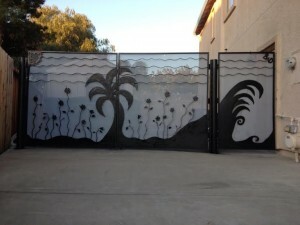 She’s now added plasma cutting to her skill set and makes creative works of steel and wood, including furniture, sculptures and decorative gates. As a female working in a male-dominated skill area, Danelle says you have to work hard and go above and beyond to earn respect and prove that you can haul your own steel and do your own work without burdening your partners and co-workers. One of the upsides to being a female welder is the “shock” factor. “So you’re really a welder?” someone will ask and Danelle will say she’s faking it. “Please ignore the burn holes in my jeans,” she’ll add, having a little fun with her doubters. Her other advice is more physically practical: to use a netti pot to clear your sinuses. “I started doing this a couple years ago and have never had a sinus infection from grinding dust or even allergens. It works great,” she says. Find out more about Danelle and check out some of her work at welderchic.com. This entry was posted in New Rosies, Working Women & Society on June 4, 2014 by Carmen. 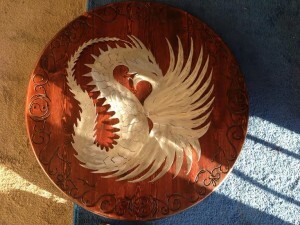 This has really motivated me to become more of a phoenix. Happy thoughts to Danelle. SHE ROCKS!